Who doesn’t love a magical landscape to play in? 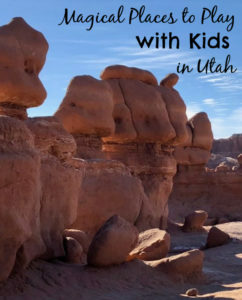 Utah is chock-full of spectacular places to take kids that are off the beaten path, outside of the well-known (and, at times, crowded) national parks. 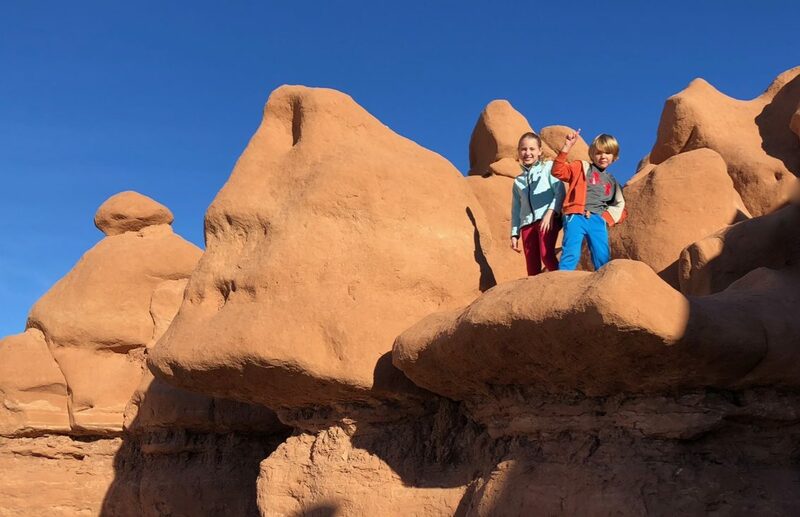 With names like Goblin Valley, Leprechaun Canyon and Hogwarts Canyon, your kids ought to be curious enough to get in the car for this road trip. Here’s their chance search for gold in a slot canyon and run from goblins on a lunar landscape. Just don’t forget sunscreen, hats, and gallons and gallons of water. If you’ve done Moab and want to move on to wilder places but aren’t ready to go off-roading, this is the itinerary for you. Cell service will be spotty. Water will be scarce, so pack a lot of it. For accommodations, you can stay in Moab if you’re looking for a nice hotel. For budget motels, Green River is an hour away from Goblin Valley and we had perfectly acceptable experience at the Super 8 there (eat at the West Wind Cafe at the truck stop, which had $3 kids meals!) If you like tents and yurts, Goblin Valley State Park has a campground. This part of Utah is offensively hot in the summer; if possible, visit in the spring or fall. 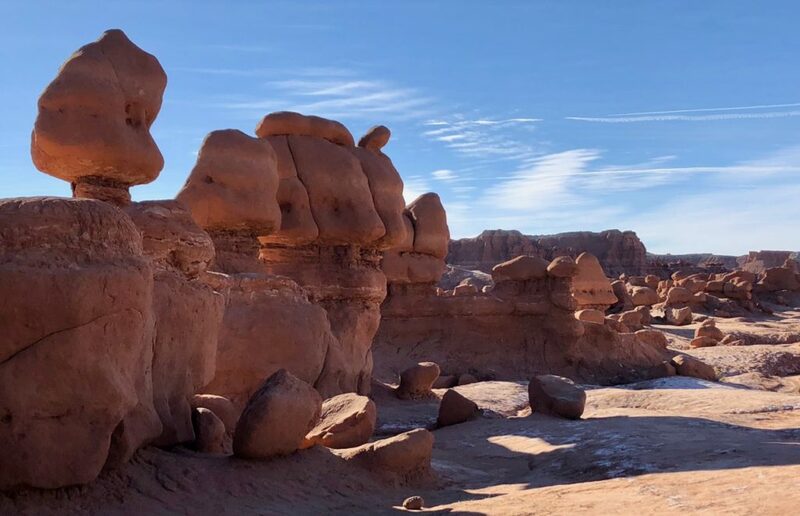 Goblin Valley is the perfect place to play hide and seek. Start your day in Goblin Valley, the closer to sunrise the better. The light is gorgeous and the sun won’t be as fierce. The wonderful stone shapes that inhabit this valley were formed from stone deposits 170 million years old, shaped over time by wind and water. This is a desert playground like no other. Although there are technically three different “trails” you can follow, basically it’s a big valley full of bizarre stone gnomes. Let the kids run loose. Stand in awe. Play hide and seek. Try not to lose anybody. Do NOT try to help nature along by knocking over a goblin: not only is that offensive to the earth and the rest of humanity, it’s against the law and there’s currently a case being convicted. This is a great place to bring walkie-talkies. You can bring whistles for safety, if your kids aren’t the type to abuse them (I don’t bring whistles). Carry bottles and bottles and more bottles of water with you. Wear hats, and reapply sunscreen regularly. My personal claim to fame is seeing Galaxy Quest filmed here. If you are so inclined, go back and watch that great cinematic accomplishment and ask yourself: Utah or another planet? To get there: Goblin Valley State Park is located 50 miles southwest of Green River off State Highway 24. Leprechaun Canyon: at the end of trail, keep going to get to the slot canyon. 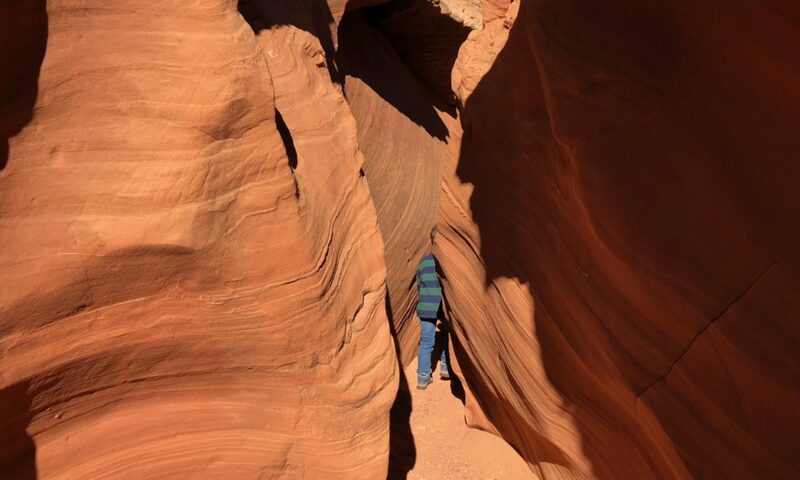 What is a visit to Utah without a slot canyon experience? 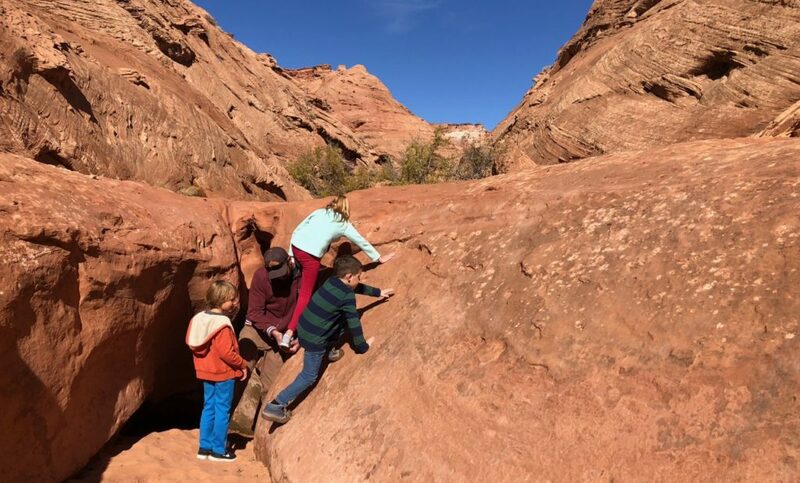 When visiting Utah with kids, what you really need is a baby slot canyon: a place where you can get a great photo without feeling like you are going to have a panic attack or have to saw off your own arm. Lucky for you, there’s Leprechaun Canyon, located right off the highway (no four-wheel drive required). It’s not well marked. I mean, it’s not marked at all, because like a lot of great natural formations on public lands, people who go there don’t want anyone else to go there. But if you can find the trail and follow it, a short ways down you will enter a tiny slot canyon that is just perfect for kids. Leprechaun Canyon technically has three forks and is a popular spot with climbers. Pay no heed to the serious people in helmets and harnesses, who will be clambering up the slick rock to the left of the trailhead. If you have little ones, from the trailhead (which is just a clearing in the dirt from so many cars parking there) follow the trail through the sparse trees. When you reach a spot where it looks like it ends in some sand, climb up the rock (you’ll have to give the kids some help up) and walk a little farther. Soon you’ll come upon the opening to a little slot canyon. A baby slot canyon is just as beautiful as any other slot canyon! There are no bathrooms and no water or any services of any kind. The closest bathrooms are at the gas station in Hanksville to the north, or at Hog Spring Recreation Area, which is conveniently only six miles to the south. To get there: When you leave Goblin Valley, head south on State Road 24 until you hit a T. This is Hanksville. Take a left at the T on to State Road 95. You will want to gas up here, and don’t miss the chance to eat Stan’s Burger Shak, conveniently attached to the gas station. (Warning: the kid’s burger here is huge. The shakes are to die for.) The trailhead is 28 miles southeast of here on State Road 95, just east of mile marker 28, on the left side of the road. We never actually made it into Hogwarts Canyon because — spoiler alert — kids poop out. But go south a little farther down State Road 95 from Leprechaun Canyon and you can visit another small canyon and easy hike. 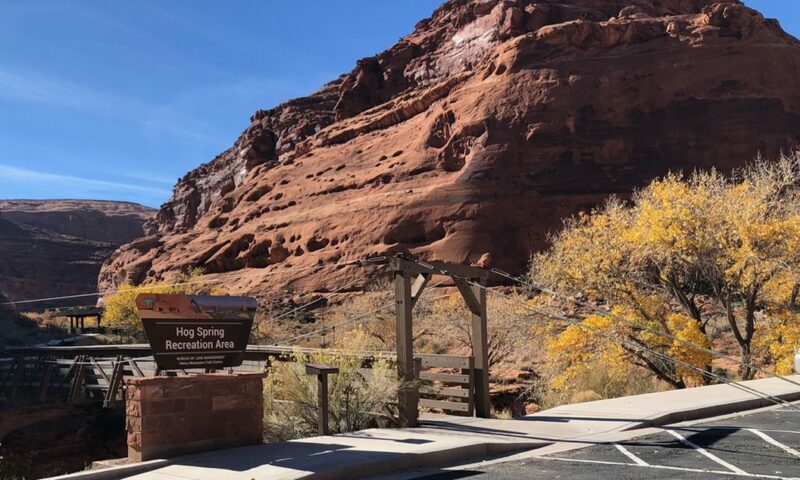 Hog Spring Recreation Area is a popular rest stop between Hanksville and Lake Powell and features restrooms, picnic tables, and, if you are willing to hike a mile in, a little pool and waterfall. Hogwarts Canyon is a technical slot canyon in this area with another fun name. If you aren’t a climber, you won’t likely be descending into this canyon, but a trip to Hog Spring may allow you to see some of those Utah climbers you’ve heard about while experiencing an easy fun hike and some red rock to boot. To get there: Continue south on State Road 95 from Leprechaun Canyon. Hog Spring Recreation Area is clearly marked on the southwest side of the road. Hog Spring is an oasis in the desert with an outhouse and a trail to waterfall, plus Hogwarts Canyon hidden in there somewhere. Save this article for later by pinning one of the pins below! Or follow us on Facebook, Twitter (where Kristin regularly mans the ship), or Instagram (where Suzi documents her life and travels).